Oregon State University researchers in Corvallis, Oregon have worked around an intellectual roadblock they say has kept potassium from serious consideration as a battery material for over eight decades. This could be good news, since potassium is more plentiful and lower cost than lithium, and according to OSU scientists, almost as energetic. Xiulei (David) Ji, the lead author of the study and an assistant professor of chemistry in the College of Science at Oregon State University. points out that potassium-ion batteries haven’t been considered since the Hoover administration. Ji said, “For decades, people have assumed that potassium couldn’t work with graphite or other bulk carbon anodes in a battery. That assumption is incorrect.” Seeing around that conventional wisdom opens new alternatives to the lithium used in electrodes of lithium-ion batteries. Even though Li is highly energetic, potassium comes close and may be tweaked to surpass lithium in combination with the right proportions of carbon. Potassium battery during potassiation/depotassiation (similar to lithiation/delithiation during charging/discharging cycles). Lithium’s big drawback is its relative rarity, composing only 0.0017 percent of the earth’s crust by weight. That’s still a big number, but found in inconvenient places like Bolivia, where huge open lithium deserts exist, but not roads or government willingness to share their resources with the U. S. A large deposit of lithium in the Nevada desert is already destined for Tesla’s gigafactory, leaving other battery makers to search elsewhere. Dr. Yi Cui of Stanford and Amprius has said that mining seawater could provide all the lithium we will ever need, but the technology to make that plausible is not yet a commercial reality. He thinks potassium will not face that difficulty, with the mineral 880 times more abundant than lithium. 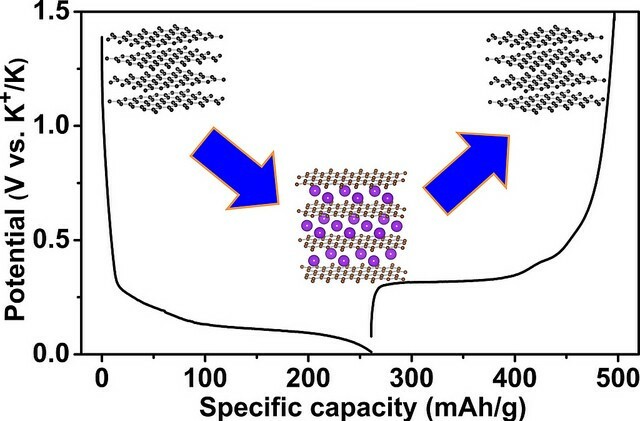 New studies showing that a potassium-carbon electrochemical battery can be close to the performance of lithium cells brings some hope work that potassium cells with graphite or soft carbon sandwiched in the electrodes may overcome the relatively lower energy density of such batteries with higher power density (important for takeoffs and climbs). K batteries may offer longer cycle life, “a lot lower cost,” and the ability to be manufactured on existing carbon production machinery. Their work had support from the U.S. Department of Energy. The team has a patent pending on their discovery.